So I added the chocolate, and I cut the sugar in half, substituting it with honey. The original recipe only has 1/2 cup sugar, so this revised version only has 1/4 cup sugar! I kept the flax seeds and the walnuts in. Why wouldn’t I? Instead of making a loaf this time, I made muffins. They cook faster and I was really excited to try this recipe out. Take 2 ripe bananas and mash them, for later use. If they are not ripe enough, you just wont get that strong banana flavor. Also chop up the chocolate and the walnuts and place aside. In a large bowl, whisk the egg and add 1/4 cup sugar, 1/4 cup honey and 1/4 cup vegetable oil. Whisk again. Next, add 1/2 cup yogurt and the mashed bananas. 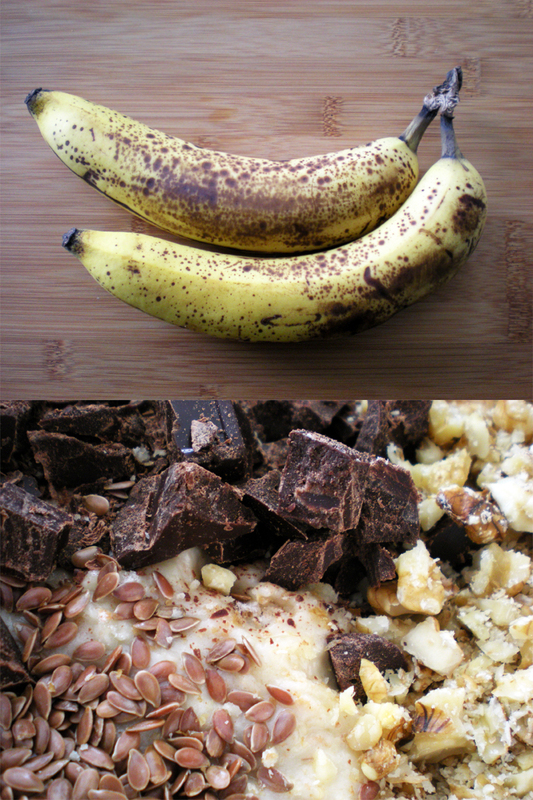 Mix well until the banana chunks are fully incorporated into the batter. In another medium sized bowl, mix 1 cup all-purpose flour and 1/2 cup whole wheat flour. Next sift in 1 teaspoon baking soda and 1 teaspoon baking powder. Mix well. Add the flour mixture to the banana mixture. Fold the mixtures together until just incorporated. Now the goods. Add in 1 cup of the chocolate chunks and 1/2 cup of the chopped walnuts and then just take a handful of flax seeds and throw them them in as well. Again, fold your mixture just until incorporated to avoid over mixing. You will end up with a batter that looks like this. Don’t eat it yet… I know it looks really good. If you want to make a loaf, make a loaf. If you want muffins, this recipe makes 12 of them. Oil up the muffin tin first. Bake at 350˚F for about 15 minutes, or until golden brown, and a wooden skewer comes out relatively clean. Remove the muffins from the hot tin and place them onto a plate. Let cool for 5 minutes. Go on. Have yourself a muffin. Question: If I choose not to use honey (seldom eat honey, except manuka honey), any advice how much sugar I need to add? Or…do you think honey will affect the taste so much & I should just purchase it? Hi Sofia. You can just replace 1/4 cup honey with 1/4 cup sugar. Honey does affect the taste, but, since its a small amount of honey, it wont change the recipe too much. You should have no problem replacing it. YUM!! My bananas are too green to bake with, dammit it all! I want one of these NOW! 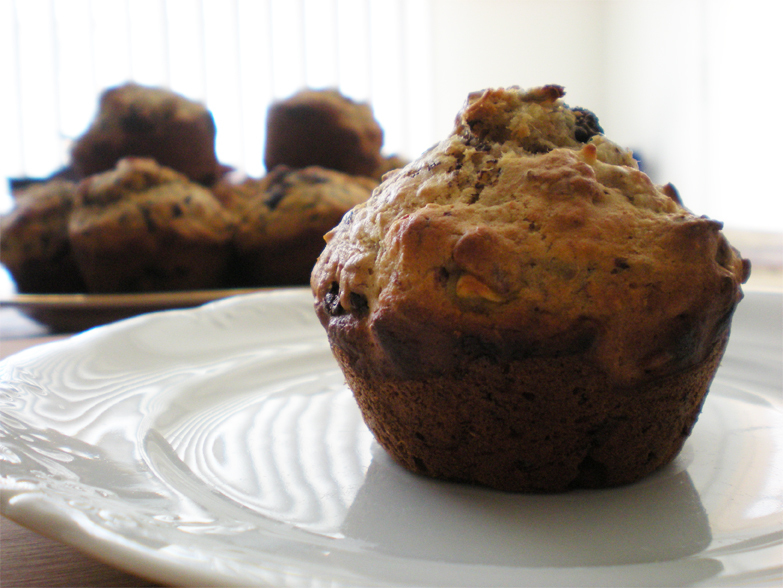 One of my favourite snacks to bake is banana chocolate chip muffins. I’m always looking for ways to make them healthier so I really like your recipe. Can’t wait to try it!